If the Mute Swan bill passed by the NY Senate does not get voted on before the Assembly recesses, NY DEC will begin killing 1400 and mutilating (amputating a portion of the wings) of 800 healthy wild Mute Swans. If the swans live through the surgical procedure, they will be placed in a captive setting. This is the NY DEC's revised Mute Swan plan which is not based on any environmental impact study or other scientific research. In fact, there has never been an environmental impact assessment of Mute Swans in the U.S.Members of the Atlantic Flyway Council, of which the NY DEC is a member, admitted that there HAS NEVER been any collaborative count of Mute Swans in the U.S. and the current population numbers are inaccurate. International swan and wetland habitat specialists state that Mute Swans are an indicator species, alerting scientists to problems in the environment.NY DEC admits this point in their management plan.NY DEC labels the Mute Swans as non-native and invasive. Current research, swan and wetland habitat specialists dispute this labeling. NY DEC completely ignores the research and experts. The NY DEC farms and introduces 30,000 non-native Asian Pheasants which have been shown to be invasive by displacing other wildlife through laying eggs in other birds' nests (Audubon/Cornell University). The NY DEC raises the pheasants in poultry settings, medicates them against parasites and then releases the non-native birds into the natural environment. Current research shows that the pheasants can shed their parasites even after medication and can also pick-up wild zoonotic diseases from the natural habitat. Last year, NJ poultry and pheasants were refused importation into Asian markets due to HN7 Avian Flu. Once again, the NY DEC ignores this research.The NY DEC states that Cornell University and National Audubon Society support the swan eradication program. Why are we not hearing from Cornell University and Audubon about the NY DEC's release of the invasive Asian Pheasants? NY DEC farms and introduces approximately 1.8 million non-native European Brown Trout into the natural habitat. The European Brown Trout is listed as one of the top 100 invasive species in the world (International Union for the Conservation of Nature, Columbia University, and National Park Service). European Brown Trout destroy native species and habitats. Once again, the NY DEC violates its own policy on invasive species ignoring current research because it makes millions from hunting and fishing permits. Does raising money for the state give the NY DEC a free pass to violate state mandates? Realistically, can all of these introduced non-native invasive species be hunted and fished?The numbers of released species (30,000 pheasants and 1.8 million Brown Trout) would indicate that some will escape capture, thus actually damaging the environment. We seriously doubt that 2200 Mute Swans can do any more damage than the actual invasive 30,000 pheasants and 1.8 million Brown Trout released ANNUALLY by the NY DEC. Furthermore, the Mute Swan population has been stable for decades. NY DEC cannot arbitrarily label one species invasive (with no research) while introducing invasive species (with research) for hunting/fishing/revenue purposes. The NY Assembly needs to get this bill passed before the summer recess. Senator Avella and the NY Senate did a phenomenal job of passing legislation after seeing through the NY DEC's misrepresented swan management plan. Now, Assemblymen Cymbrowitz, Englebright and Thiele and the rest of the Assemblypersons sitting on the Environmental Committee and the General Assembly need to prevent the arbitrary killing of the Mute Swans by the NY DEC. 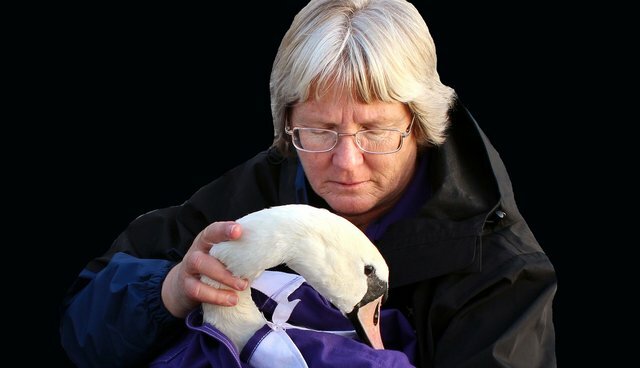 If the bill is not passed, not only will Mute Swans suffer, but many species are in danger of being destroyed under the guise of conservation and wildlife management. The NY DEC must be held accountable for their policies regarding wildlife management without scientific basis and violation of NY's own invasive species policy. Sheila Bolin, CEO/President, The Regal Swan Foundation, Inc.